Researchers have found a higher rate of collagen degradation among Friesian horses which they say may explain, at least in part, some connective tissue disorders linked to the breed. 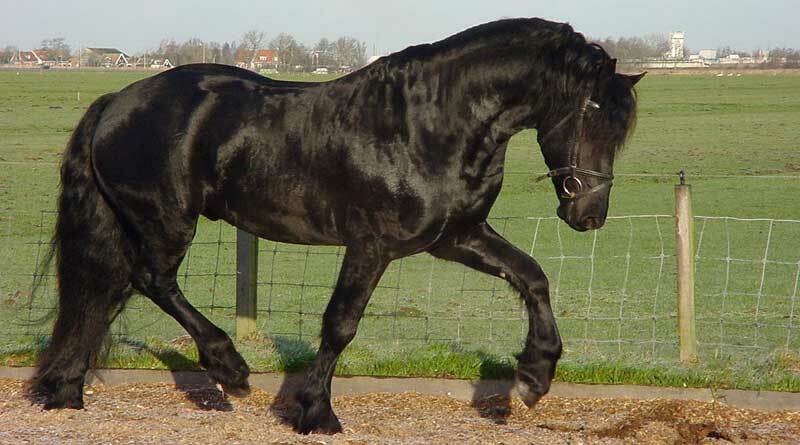 Friesian horses are known for their high inbreeding rate, which has resulted in several genetic diseases such as hydrocephaly (fluid buildup which puts pressure on the brain) and dwarfism. In recent years, several studies have focused on two other presumed hereditary traits in the breed – megaoesophagus (a disorder in which the esophagus becomes abnormally enlarged) and aortic rupture. The manner in which these diseases develop remains obscure, but an important role of collagen has been suggested. Collagen is the main structural protein found in skin and other connective tissues. In both cases, an increased deposition of clumped collagen at the site of the aortic rupture and in both the dilated and non-dilated part of the oesophagus has been reported. Veronique Saey and her Ghent University colleagues, writing in the journal BMC Veterinary Research, noted that research on collagen metabolism in Friesians was scarce. They set out to examine possible breed-related differences in collagen catabolism – the timely breakdown of these proteins in order to maintain healthy body tissues. The study team took urine samples from 17 Friesian horses and 17 Warmblood horses for comparison. They found elevated levels of free pyridinoline in the urine of the Friesian horses when compared to the Warmbloods. This finding, they said, pointed to a breed-specific increase in collagen degradation among Friesians, most likely originating from soft tissue catabolism. “This difference in collagen metabolism could explain the known soft tissue abnormalities in Friesian horses, such as megaoesophagus and aortic rupture,” they reported. The study team comprised Saey, Richard Ducatelle, Siska Croubels, Siegrid De Baere, Stijn Schauvliege, Gunther van Loon and Koen Chiers, all affiliated with Belgium’s Ghent University; and Jonathan Tang, from the University of East Anglia in England.